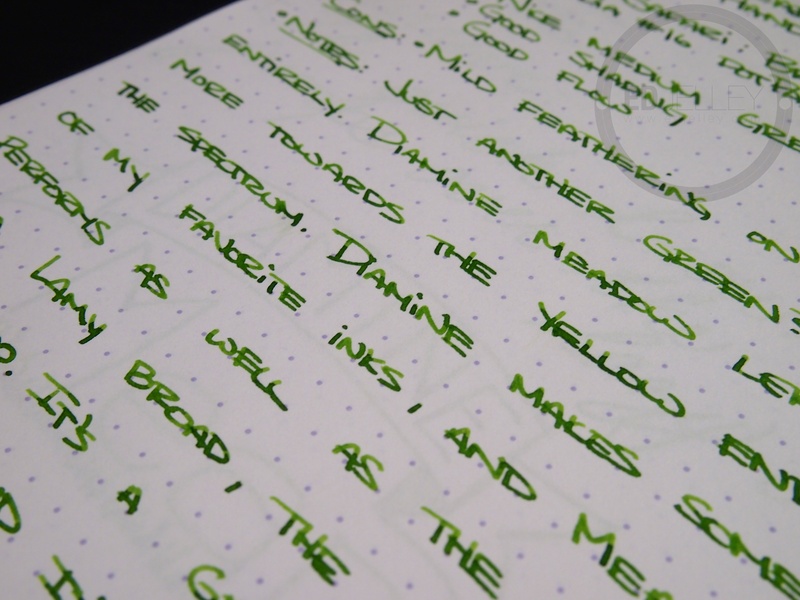 Just another green ink? Not entirely. 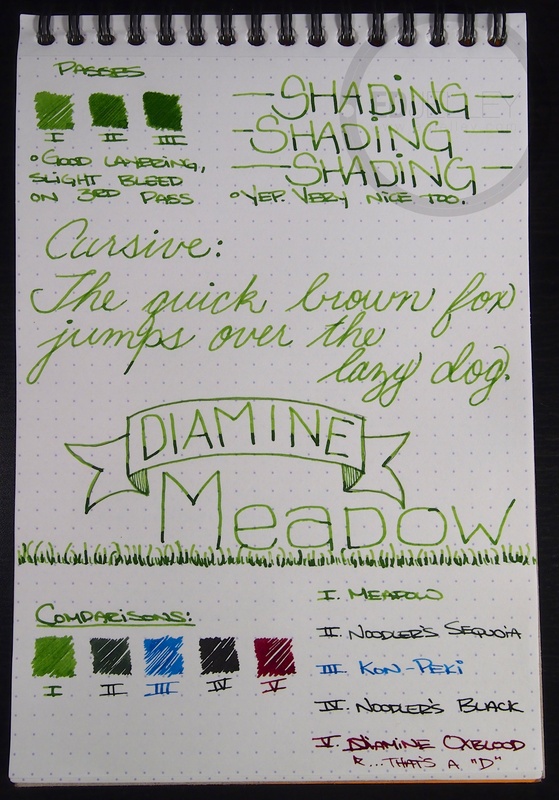 Diamine Meadow leans more towards the yellow end of the spectrum. 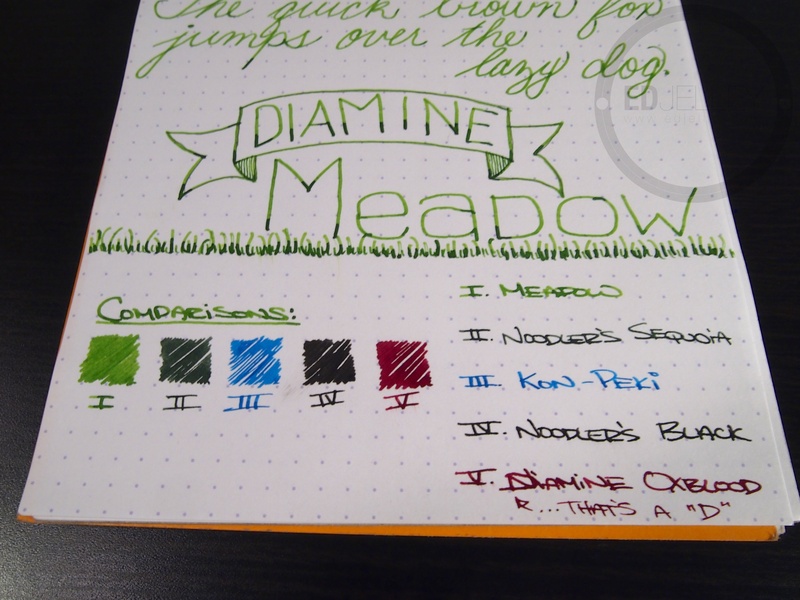 I’ve said it before, and I’ll say it again, Diamine makes some of my favorite inks, and Meadow performs as well as my favorites. 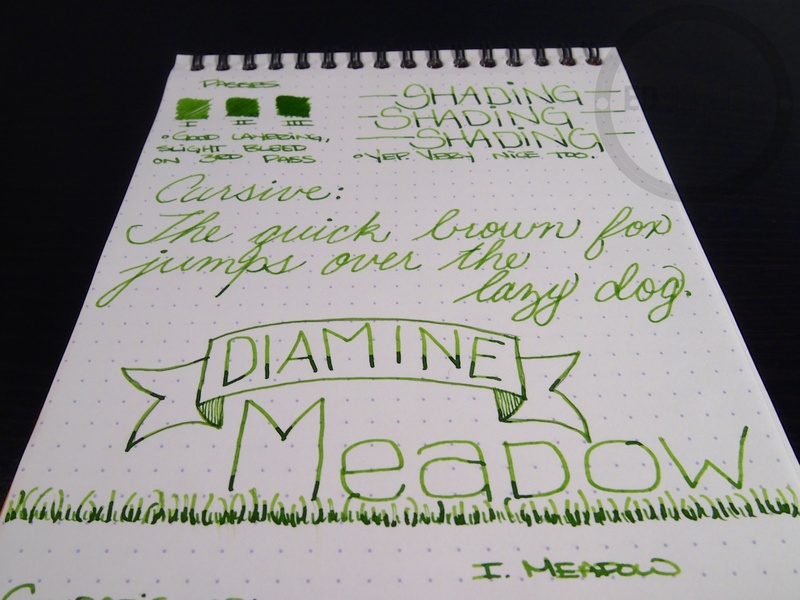 This ink shades like crazy with a broad nib, and I bet it would be even better in a stub. 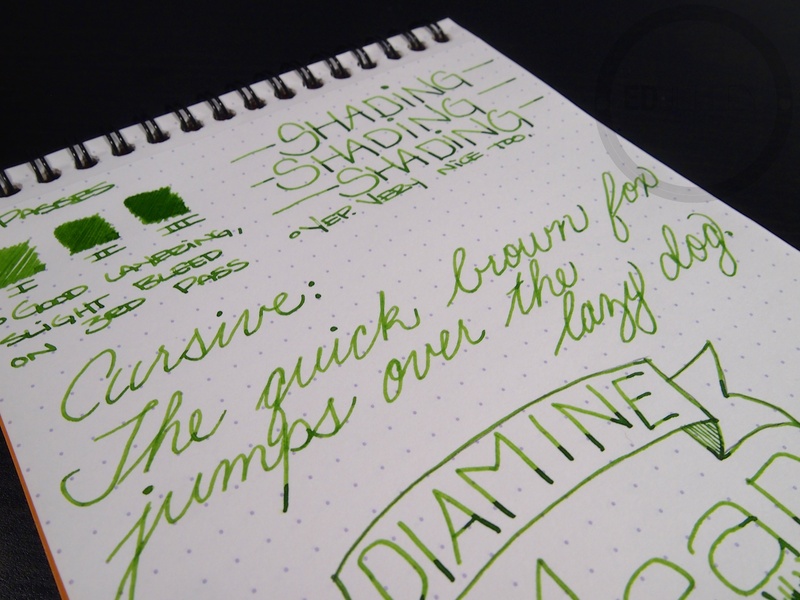 It’s a great summery color and it’s a pleasure to write with. If you like what you see, definitely check this one out. 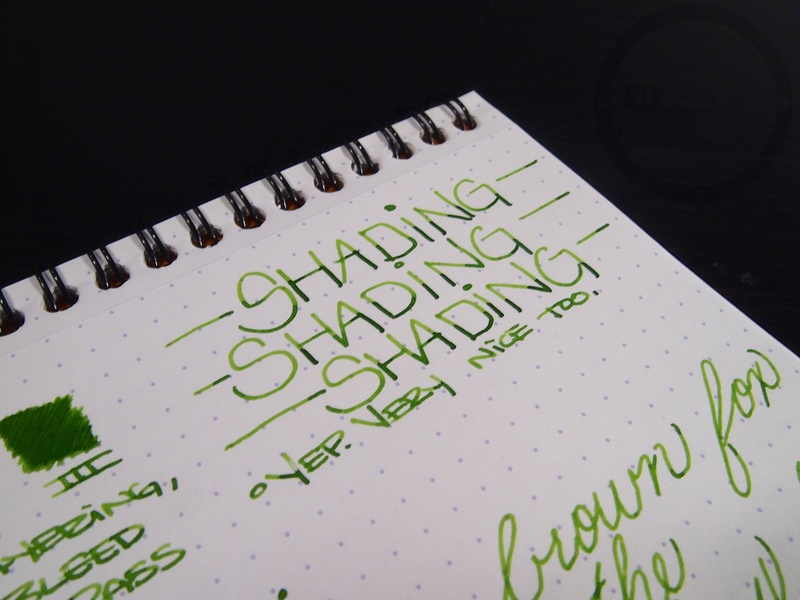 I would recommend this ink to anyone who likes the shading of Rohrer & Klingner’s Alt-Goldgrun, but aren’t crazy about the mustard-like undertones in the color. I was sent a sample of this ink by one of my Instagram followers, so thanks @klpeabody for the ink! Yellowy-green, but not obnoxious. 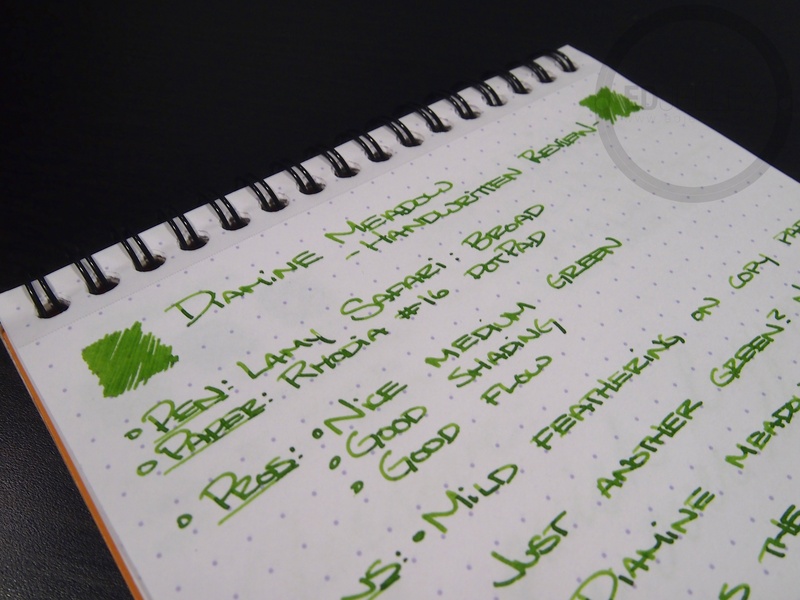 This would be right at home in a Lamy Limited Edition Apple Green Safari. This ink has a bit more yellow than Diamine’s Apple Glory. The broad nib makes for some great shading, but everything is still legible. Yes, it shades. Layering is pretty nice too. There’s some slight bleed-through on the third pass. The cursive writing makes me want to put this in a flex nib. So now that has to happen.  Diamine banner. 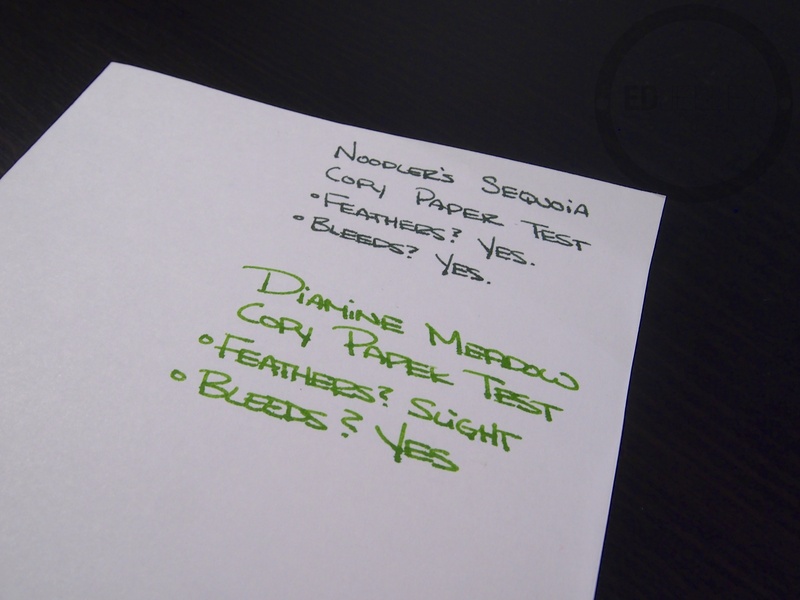 Glad I didn’t screw this one up as bad as I did the one in the upcoming review for Noodler’s Sequoia. Comparison inks aren’t really relevant, but they were the closest pens with ink in them. I’m now going to be doing copy paper tests. Nothing crazy, but I have no idea why I failed to include these in everything else. You see some slight feathering, and there’s a little bleed through. Keep in mind, this is a broad nib. I’m sure the ink would do just fine in a fine, or extra fine. Pen Addict Podcast Episode 65 – I’m the guest! As always a superb review – it really is much appreciated. Thank you. And a nice colour: I might load this one next. Great collection, no such thing as too much Diamine! That is a beautiful shade of green and I have it on my wish list. A penpal sent a letter written with it and it was love at first sight. Hahahaha a less ugly Alt-Goldgrun, well yes, I see what you mean. It’s a lovely colour. I must have it. Sigh. I didn’t mean it was *ugly* ugly…it’s just a little reminiscent of bile. This one just cuts that down a tiny bit, haha. Great review as always thanks. I’ve tried it and our results were the same it’s a big shader. If that’s your thing you can’t go wrong here. Thanks for reading! If you want a green shader, I’d go with this, Private Reserve Sherwood Green, or R&K Alt-Goldgrun. All great inks! Nice review, very pretty shade of green. 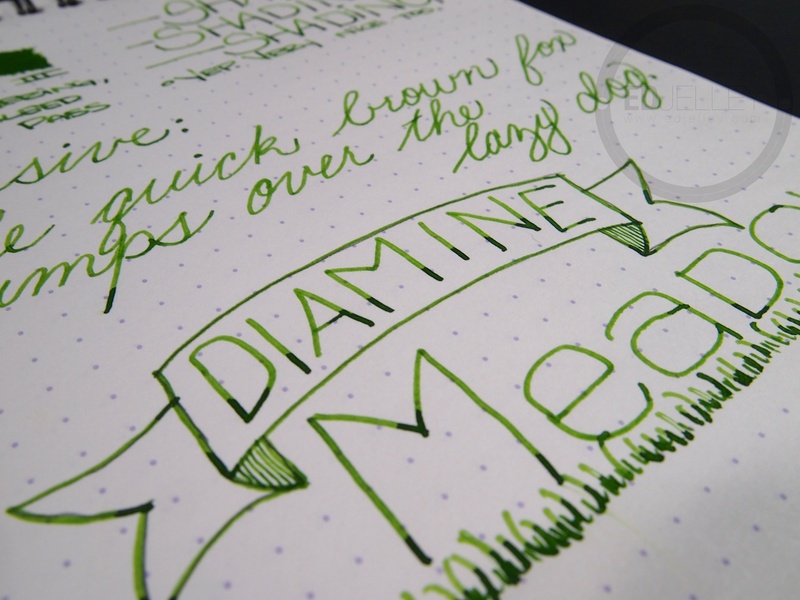 I’ve yet to try anything from Diamine but you’re make a strong, strong case for them. 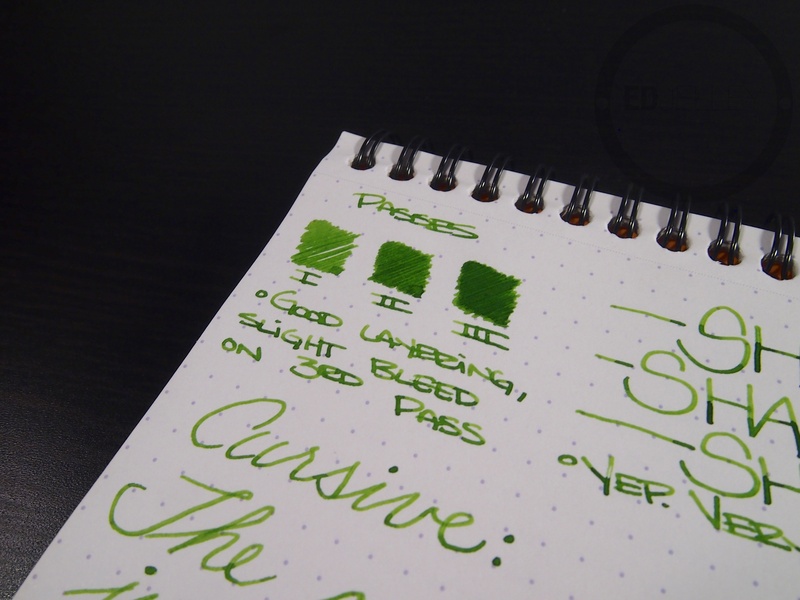 I noticed one of your comparison inks was Noodler’s Black, which was conspicuously absent from your previous comparison of blacks from Noodlers. Any chance of an update? Thanks for reading it! It’s definitely one of my favorite (if not favorite) brands of ink. Pretty much every ink I’ve tried from Diamine has been great. 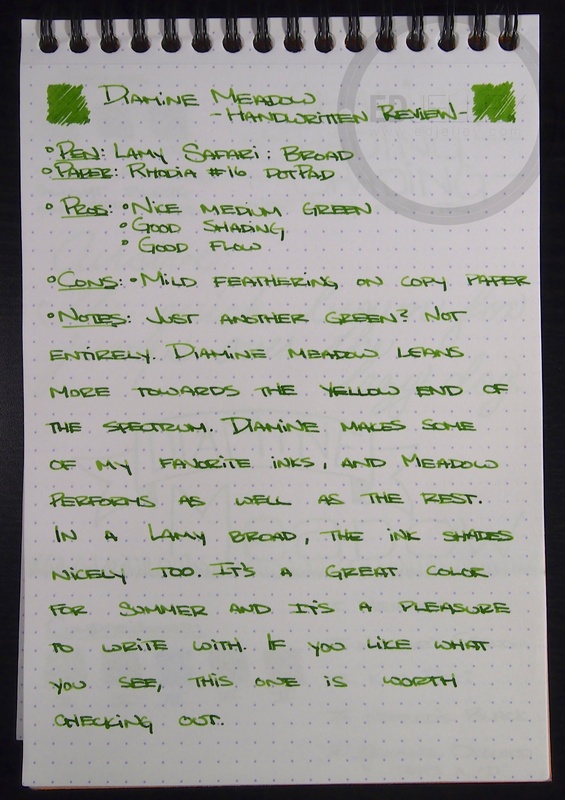 I’ll definitely update the Noodler’s Black comparison, someone was nice enough to send a sample. Just haven’t gotten around to it yet, thanks for reminding me! I don’t want people to think I didn’t like Alt-Goldgrun, it’s just that this one is a little easier on the eyes. 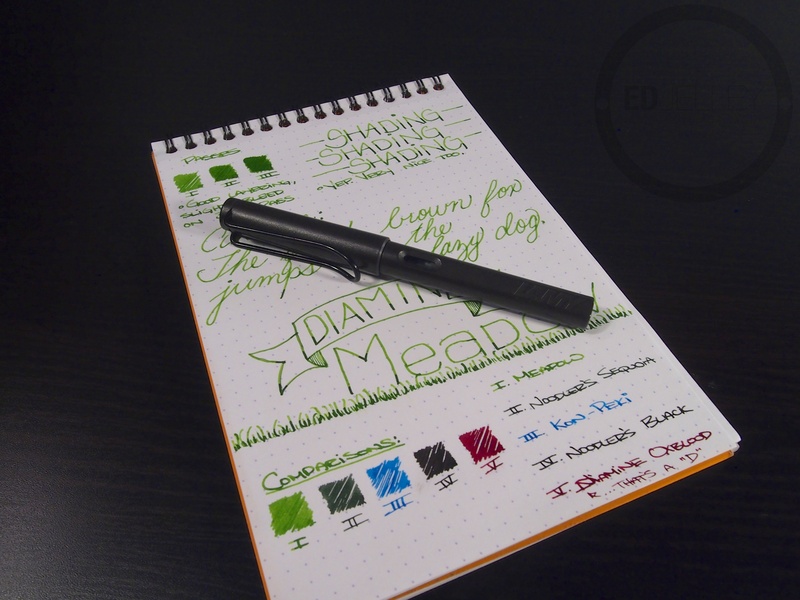 Great review – Diamine are outstanding! Thank you! I think at this point it’s my favorite brand of ink. Cost-effective, well behaved, and pretty much every color you could ask for.